I loved this series so much I'm not sure I've moved past it or that I even will. I should preface this by saying that I picked up Sarah J. Maas' Throne of Glass what seems like ages ago and was singularly unimpressed. Like massively so. I didn't even finish it, though I feel like I did give it the old college try. I realize its original cover did it a disservice. But at the time, nothing about that first story felt unique. It felt tired, like I'd read it before, and the writing did not stand out to me in any way. Fast forward a few years, and I just kept hearing absolute knockdown raving about Ms. Maas' newer series—A Court of Thorns and Roses. The first book was out in paperback and something about all of your glowing comments (and the beautiful cover) pushed me over the edge. I read and thoroughly enjoyed the first book, which is a lovely mashup of the Beauty and the Beast and Tam Lin fairy tales (I know, it's like it was tailor fit for me). The book builds and builds to a wonderfully satisfying conclusion that left me very eager for more. Fortunately for me, A Court of Mist and Fury was already out and A Court of Wings and Ruin was soon to be released. I call that timing providence, because I am forever the one waiting years and years for the next book to come out. Feyre Archeron survived. But almost in name only. She is returned to the Spring Court. Returned to Tamlin. To a place that used to feel safe. But the effects of her time Under the Mountain, in Amarantha's clutches, will never fade. To say nothing of the bargain she made with Rhysand—High Lord of the Night Court. And so her days are spent in a protective bubble of silence and seeming serenity. While Tamlin and his advisers plot revenge, Feyre is left to dwell on the blood on her hands, on the emptiness inside her, and on the fury she feels for the mercurial fae who is set to whisk her away each month. But when her increasingly intolerable existence reaches the breaking point, it is Rhys who winnows her away for good. 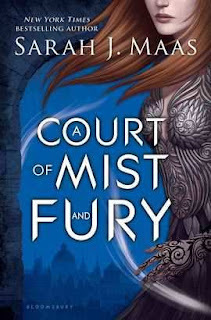 Then Feyre is forced to learn a new court and a new people, as she finds herself woven into the even greater plans of the High Lord of the Night Court, who is not at all what he seemed. Through Rhys, she meets the Inner Circle—a group of comrades I defy anyone to resist. And it is Cassian and Mor, Azriel and Amren who fill in the cracks in Feyre's heart, who help her find a cause worth surviving for again. Rhys's lip pulled back from his teeth. "I dare you." Temper—he had to be in some mood today to let his temper show this much. I had to start with that quote, because it was at that precise moment that the first breath of laughter bubbled up out of me. And my affection for these two only grew. In fact, it grew beyond even my wild expectations. I didn't know. I suspected, but I didn't know that Sarah J. Maas had it in her to capture my imagination and affections so thoroughly and swiftly. With the flinging of just one shoe. But she did. And I, like Feyre's shoe, hurtled through the air of this beautiful book. I utterly enjoyed the first book in this series, particularly the final third, which I thought was masterfully done. But I haven't fallen in love with a tightly knit band of characters like I did with Rhys' Inner Circle in some time. They remind me ever-so-fondly of my beloved comrades from Sharon Shinn's Mystic & Rider series. I think about them all the time. My heart was in my throat over their fates the entire length of the novel. Cassian and Azriel—the winged Illyrian pillars of my heart. Mor and Amren—the endlessly complex and powerful women who are never bowed. And Feyre's own sisters who play larger and much more vital roles in this book. But the arc between Rhys and Feyre is the soul of this novel (and this series). I will go down with their ship. I will kill anyone who harms you," Rhys snarled. "I will kill them, and take a damn long time doing it." He panted. "Go ahead. Hate me—despise me for it." "You are my friend," I said, and my voice broke on the word. I hated the tears that slipped down my face. I didn't even know why I was crying. Perhaps for the fact that it had felt real on that throne with him, even for a moment, and . . . and it likely hadn't been. Not for him. "You're my friend—and I understand that you're High Lord. I understand that you will defend your true court, and punish threats against it. But I can't . . . I don't want you to stop telling me things, inviting me to do things, because of the threats against me." Darkness rippled, and wings tore from his back. "I am not him," Rhys breathed. "I will never be him, act like him. He locked you up and let you wither, and die." "Stop comparing. Stop comparing me to him." The words cut me short. I blinked. "You think I don't know how stories get written—how this story will be written?" Rhys put his hands on his chest, his face more open, more anguished than I'd seen it. "I am the dark lord, who stole away the bride of spring. I am a demon, and a nightmare, and I will meet a bad end. He is the golden prince—the hero who will get to keep you as his reward for not dying of stupidity and arrogance." The things I love have a tendency to be taken from me. He'd admitted that to me Under the Mountain. But his words were kindling to my temper, to whatever pit of fear was yawning open inside of me. "And what about my story?" I hissed. I love them because I didn't see them coming. Because they never give up on each other, because their understanding of each other is stronger and deeper than anyone can tell. It. Will. Survive. These two are equally magnetic, equally layered, and elegantly rendered. As beautiful as Rhys' home of Valeris, their friendship and unswerving loyalty are epic. And they are absolutely required to be in order to match the sweep of this world and the demands of their story—from the eerie lair of the Bone Keeper, to the heartless thirst of the King of Hybern, to the ponderous depths of the Cauldron itself. If you have been wavering on the edge of this series, you simply must dive in. This band of heroes is too worthy of your love to miss.